Local threats to biodiversity are increasingly caused by distal drivers. Likewise, conservation responses are increasingly shaped by distal actors and processes as information on biodiversity loss percolates, and this, in turn, triggers conservation actions. Here, we define these actions as conservation telecouplings, that is, the coupling of distal social-ecological systems through conservation responses. These conservation responses can take diverse forms, such as inflows of funding, capacity, policies, or concrete projects, but always originate in one system in response to biodiversity loss in another. 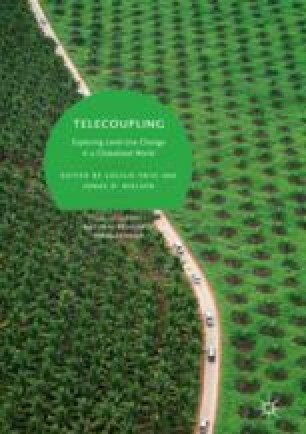 We discuss major types of conservation telecouplings and highlight how this concept might help to distinguish between targeted and diffuse threats by detecting entry points for conservation, by increasing conservation effectiveness, and by opening up new ways for conservation planning. This work has received support from the European Union’s Horizon 2020 research and innovation programme under Marie Skłodowska-Curie Actions grant agreement No. 765408 (COUPLED, http://coupled-itn.eu) and from the European Research Council (ERC) under the European Union’s Horizon 2020 research and innovation programme grant agreement No. 677140 (MIDLAND, https://erc-midland.earth). This work contributes to the Global Land Programme (www.glp.earth). Gardner, Toby A., Magnus Benzie, Jan Börner, Elena Dawkins, Stephen Fick, Rachael Garrett, Godar Javier, A. Grimard, S. Lake, R.K. Larsen, N. Mardas, C.L. McDermott, P. Meyfroidt, M. Osbeck, M. Persson, T. Sembres, C. Suavet, B. Strassburg, A. Trevisan, C. West, and P. Wolvekamp. 2018. Transparency and Sustainability in Global Commodity Supply Chains. World Development. https://doi.org/10.1016/j.worlddev.2018.05.025. Hanson, J., R. Schuster, N. Morrell, M. Strimas-Mackey, M. Watts, P. Arcese, J. Bennett, and H.P. Possingham. 2017. Prioritizr: Systematic Conservation Prioritization in R. Version 4.0.2.7. Available at https://github.com/prioritizr/prioritizr.